Fresh off an impressive 4-1 win over the San Jose Sharks, the Washington Capitals return to Capital One Arena ice on Wednesday night against another Western Conference opponent. The Chicago Blackhawks come to Washington in what has become a most surprising rivalry. The Caps have a six-game winning streak against the Blackhawks on home ice dating back to November 2008. The last Chicago win on this ice sheet was a 4-3 overtime win on January 10, 2006. The Caps are on a roll at home with a record of 9-2-0 in their last 11 games on home ice. Meanwhile, the Blackhawks are struggling of late, losers of four in a row (0-2-2) and with a 6-5-3 record on the road this season. 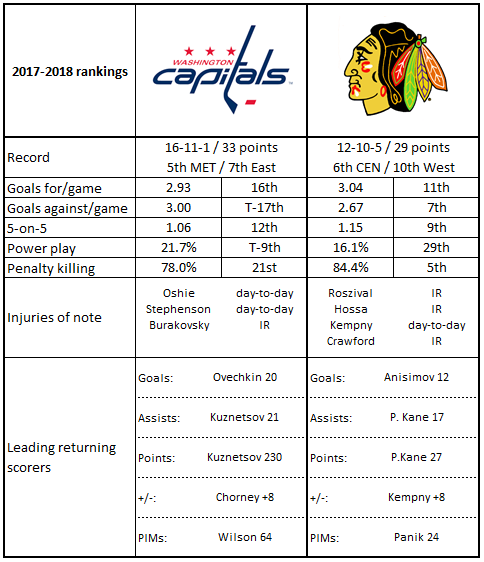 The four game-losing streak the Blackhawks bring to Capital One Arena look like a run of bad luck as much as anything else. Three of the losses were by one goal, one in overtime and one in a Gimmick. The other loss was a two-goal loss to Los Angeles in which the Kings scored an empty net goal late for the final margin. The odd thing about the four-game losing streak for Chicago is that while they have spread their goal-scoring around – eight different players have goals – none have more than one in that stretch. One of those players is a forward who seems to have been playing in the NHL forever but is not yet 30 years old. Artem Anisimov is with his third NHL team in the Blackhawks (Columbus and the New York Rangers being the other), skating for his third season in Chicago. His goals per game, assists per game, and points per game have improved with each stop along the way, averaging 0.19-.025-0.44 per game in 244 games with the Rangers, 0.24-0.26-0.50 in 168 games in Columbus, and at the moment 0.32-0.29-0.61 in 168 career games with Chicago. His 12 goals in 27 games this season puts him on a pace (36 goals) that would obliterate his previous career high (22 goals set with Columbus in 2013-2014 and tied with Chicago last season). It is more than a bit surprising that over the past two seasons, Anisimov’s 34 goals is second-most on the club, topped only by Patrick Kane’s 44 goals (he leads the club this season). And if you are thinking that ranking is more a product of Artemi Panarin moving on to Columbus, Anisimov’s 34 goals come in 91 games, while Panarin’s 31 (third-ranked over the past two seasons) came in 82 games. He is 3-6-9, minus-2, in 20 career games against the Caps. Cody Franson is the only Blackhawk defenseman with a goal in this four-game losing streak for Chicago. Franson is another well-traveled player, this first season with Chicago being his fourth stop in his nine-year NHL career (Nashville, Toronto, and Buffalo being the others). That goal he has in this streak is the only one Franson has this season, not an especially surprising state given that his career high in goals is eight, recorded with Nashville in his sophomore 2010-2011 season. It has been an odd season for Franson, extending back to the off-season. An unrestricted free agent, he was signed to a professional try-out contract by Chicago in early September. He showed enough for the Blackhawks to extend to him a one-year contract with a $1 million price tag. He sat for the first three games this season, the odd righthanded defenseman out. He appeared in just two of the Blackhawks’ first 11 games, but since getting a sweater against the Colorado Avalanche in the last game of October, he sat out just one game (against New Jersey on November 12th). Franson is 4-5-9, plus-1, in 20 career games against Washington. In the storied history of the Chicago Blackhawks dating back to 1926, Corey Crawford is third on the all-time franchise list of goaltenders – 80 in all – in wins (225). He is 12th on the wins list among active goaltenders. However, Crawford is on the injured reserve list at the moment with a lower body injury, which could leave the netminding duties in the hands of backup goalie Anton Forsberg. It is an unfamiliar situation for Forsberg, who has just 18 games of experience on his NHL resume over four seasons, the first three of which he spent in Columbus after being taken in the seventh round (188th overall) by the Blue Jackets in the 2011 entry draft. He has already posted a career high of eight appearances this season with Chicago, but his career numbers (2-11-3, 3.57, .896) and 2017-2018 numbers to date (1-3-3, 3.04, .914) remain modest. Forsberg has one career appearance against the Caps and an historic one at that. On January 2, 2016 he relieved the injured Curtis McElhinney in overtime of a 4-4 game. He stopped all six shots he faced in the last 4:05 of the extra frame and stopped two of three trick shots to earn the win, the first goalie in NHL history to earn his first career win without playing in regulation time. If not Forsberg, it could be Jean-Francois Berube, recently of the Rockford IceHogs in the AHL. His route to the Blackhawks was even more circuitous than Forsberg’s, having been drafted in the fourth round (95th overall) in the 2009 entry draft by the Los Angeles Kings, but never playing for them, waived by the team in October 2015 after the Kings signed Jhonas Enroth to be their backup. He was claimed by the New York Islanders, for whom he appeared in 21 games over the last two seasons, going 6-4-3, 3.11, .900. After last season, his career path took an odd turn. He was an impending Group VI free agent based on a limited number of games played and was selected by the Vegas Golden Knights in the expansion draft last June, a selection based on a trade between those two teams that involved promises, an injured center, and draft picks. Less than two weeks later he signed as a free-agent by the Blackhawks. Since then he has toiled in the AHL waiting his first appearance with Chicago. Perhaps this will be the night. It would be his first career appearance against the Caps. 1. Chicago brings a bit of a leaky defense to town. Through Monday’s games, only two teams – Anaheim (36.3) and Florida (35.6) – have allowed more shots on goal per game than the Blackhawks (33.7). However, they do have decent shot attempt numbers at fives, ranking ninth in shot attempts-for percentage (51.38 percent). 2. The Blackhawks bring the league’s third-best road penalty kill into this game (87.9 percent), pending Tuesday’s results, trailing only Toronto (89.4 percent) and Los Angeles (91.5 percent). Much of that is an early season phenomenon, though. Chicago was 20-for-21 over their first four games on the road (95.2 percent). Since then, they are 31-for-37 (83.8 percent). 3. Chicago has a very odd penalty profile on the road. Their 128 penalty minutes in road games is just 18th-most in the league. Their 63 penalties ranks eighth. However, 62 of those 63 penalties are minor penalties – third-most in the league. Chicago and Carolina are the only two teams in the league without a major penalty on the road. 4. Maybe it’s the arena lighting that is more to their liking at home, but the Blackhawks have the sixth-worst shooting percentage on the road (7.9 percent). 5. Chicago has 12 wins but game-winning goals from only three players, and two of them account for 11 of the total – Brandon Saad (six) and Artem Anisimov (five). Lance Bouma has the other one. This team Caps team is probably better, but then again, so is Chicago’s. 2. Only three teams have more power play chances on home ice than the Caps (56) this season – Ottawa (57), Chicago (59), and the New York Rangers (67). 3. On the other hand, only five teams have been shorthanded more than the Caps (47) on home ice. Not good, given that the Caps rank 23rd in the league in home penalty killing (76.6 percent). 4. The Caps are in the top ten in credited hits at home (318/9th) and blocked shots (225/7th). That might be a credit to grittership, but it also might be a reflection of ranking 24th in shot attempts-for percentage at home (48.12; numbers from NHL.com). 5. Washington has the third-best faceoff winning percentage on home ice (55.5 percent), trailing only Nashville (56.0 percent) and Philadelphia (56.4 percent). If good things come in small packages, Alex DeBrincat is a fine package. Of 762 skaters to dress in the NHL this season, DeBrincat is the second shortest at 5’7” (Colorado’s Rocco Grimaldi is one inch shorter), and at 165 pounds, only seven players weighing less have appeared in an NHL game. Nevertheless, DeBrincat’s 11 goals trails only Vancouver’s Brock Boeser among rookies, and his 19 points rank fourth in this year’s rookie class. He has been very efficient in doing so, since he ranks just 30th in average ice time (14:25) among rookies appearing in at least ten games. He is one of three rookies this season to record a hat trick (Boeser and Adrian Kempe being the others), that coming in a 7-3 Chicago win over the Anaheim Ducks on November 27th. The four points he recorded in that game is just one of four such games by rookies this season (Boeser and Kempe with four point games, Mathew Barzal with a five-assist game against the Colorado Avalanche on November 5th). This will be his first career appearance against the Capitals. Christian Djoos is one of the few players in the league as slightly built as Chicago’s DeBrincat, and although his rookie footprint is not as deep as his counterpart, it has been a decent opening in his NHL career. He is one of just seven of 39 rookie defensemen to record two or more goals (he has two), and his plus-4 is tied for seventh in his rookie defenseman class. What is more, he has improved in that last statistic, having recorded just one “minus” game in his last 14 contests (minus-1 in the 4-3 win over Columbus last Saturday). He has had relatively sheltered minutes, particularly at home where he has topped 15 minutes played just once in ten games at Capital One Arena. This will be his first career appearance against Chicago. Out of adversity comes opportunity. With Andre Burakovsky still sidelined and T.J. Oshie joining him after sustaining an injury Monday night, the Caps will be just that much thinner among the forwards. This is where we say it would be a good time for Nicklas Backstrom to break out of his goal-scoring slump (21 games and counting), and that would be true. But it is also a chance for others. For instance, Jay Beagle has not scored on a goaltender since Game 8, a shorthanded goal against the Detroit Red Wings in a 4-3 win (his two goals since were of the empty net variety). Tom Wilson doesn’t have a goal in his last 14 games. Madison Bowey is looking for his first NHL goal, while fellow defenseman Matt Niskanen is looking for his first one this season. There is room for folks to step up and fill in with a couple of key contributors out of the lineup. They will have to against a struggling, if prideful bunch such as the Blackhawks.